Where do I have to sign? Let’s begin a campaign! Me encanta la grandilocuencia imponente pero sin estridencias, de líneas simples y puras de ese tipo de construcciones. the building’s condition has been described as “very bad” by English Heritage, who include the power station on its Buildings at Risk Register. I’m feeling really jerked around in regard to grammatical number here. It’s funny that there isn’t a campaign — or maybe there is, I’ll have to check. According to google translate: I love the grandly impressive, but without fanfare, simple and pure lines of such buildings. The worst thing is a leaking roof; here there is no roof at all. Many people in Britain don’t pay much attention to the agreement of singular and plural pronouns. I don’t know why not, except that there’s little or no approbrium if you get it wrong. There is no problem with the number agreement, only subtleties in British English when dealing with groups: here English Heritage is a society, not a single individual, and therefore can be considered as a plural noun. In another context it might be considered as a unit and take singular agreement. This is a matter of noun-verb agreement, not pronouns. Crown and m-l: Oh, I see, you have already introduced the word “pronoun” into the discussion, so you did notice the “its” after all. In the US people will say “who left their dirty boots in my oatmeal?” if they want to avoid gender issues, but that’s a different noun/pronoun number agreement thing. A Committee can either “has” or “have” depending on individual choice, I find. Re Battersea, it has been a long and sorry story on entrepreneurs who announce flamboyant plans to turn it into a theme park, hotel or whatever, start gutting it and then run out of money. Its happened several times. I don’t have time to look it up now. There is a new plan at the moment as part of the re-development of the whole area. Lord knows what will happen. Thge real tragedy, to me, is that they scrpped all the wonderful turbines and other equipment in the first would-be development. It wouyld have made a fabulous adjunct to the Science Museum. To Ø, Yes. Or more likely “The Committee’s left all their dirty boots ..” since they or it has or have more than one pair. You wouldn’t have it inscribed on your gravestone, but someone might well say it. Canehan, the site for the new American embassy is in Battersea. Couldn’t they renovate this instead? They could have huge flags on top of the chimneys. 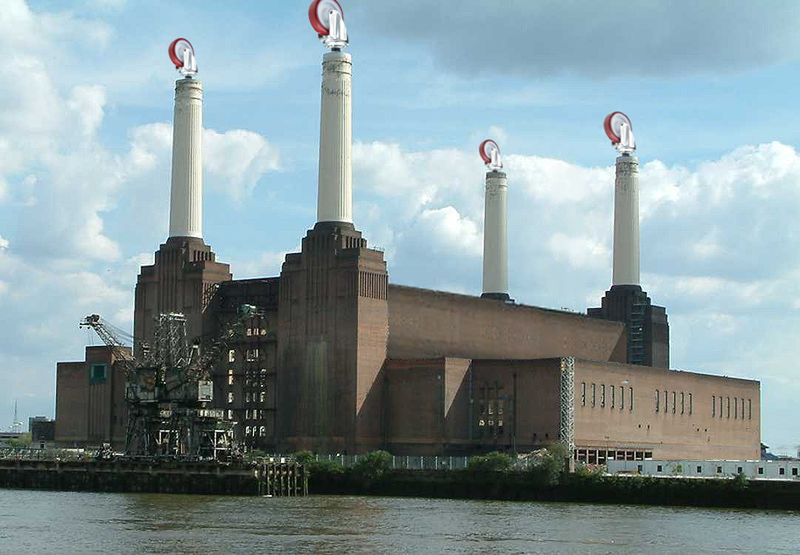 Or what about Battersea Dogs’ Home: a different dog on each stack? That’s better, Britain’s love of animals symbolised on a prominent landmark. 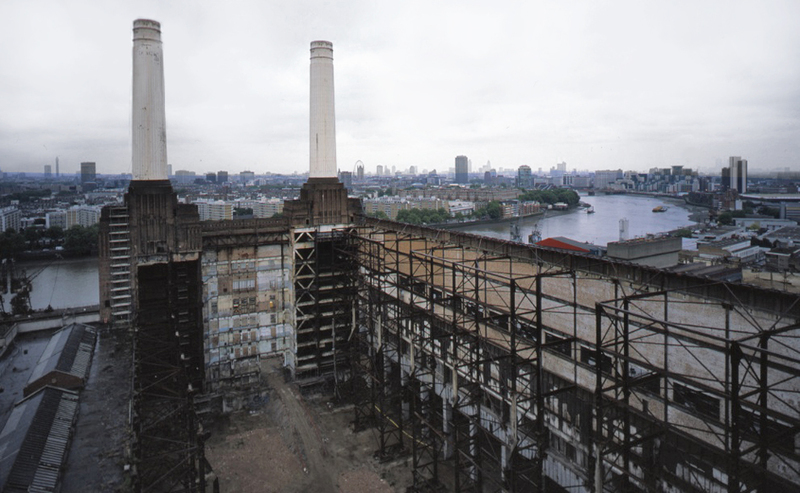 I’ve just seen these pictures and the Battersea Power Station reminded me the album’s cover image of “Animals” by Pink Floyd. And it’s right! What a lovely souvenir. Thanks, Jesús. Here’s a video of it. You see it has lots of history. Noel Coward was born just down the road. It could become the new Dogs’ Home slash Noel Coward & Pink Floyd museum. A: The Committee have left their secret papers in my porridge. B: The Committee has left its secret papers in my oatmeal. This is American English, although we might want to change “porridge” to “oatmeal”. C: The Committee have left its secret papers in my porridge. This would pass unnoticed in the UK? D: The Committee has left their secret papers in my porridge. X: Somebody’s been putting their secret papers in my porridge. Which is what you say when you don’t know, or don’t want to emphasize, the gender of the miscreant. Okay, it sounds a bit funny. It’s the kind of vacillating stumble one might make in a spoken statement, but I don’t think most people would write it. It’s a Wikipedia typo — not the first, either. British people would be more likely to pour the porridge into the boot than place the boot in the porridge; that seems like common sense to me. You could very easily hide a cell phone in a bowl of porridge without causing any damage. Dearie, I ought to have written that Coward lived in a block of mansion flats in Battersea when he was young. Apparently he was born in Teddington. You could very easily hide a cell phone in a bowl of porridge without causing any damage. Father Bear: Someone has put his phone in my porridge. Mother Bear: Someone has put his or her phone in my porridge. Baby Bear: Someone’s put their phone in my porridge, and its ringing! Teddington, Shmedington. I don’t know London at all. There’s a river running through it; that’s about where my knowledge stops. Surely Baby Bear texts? Texting is a lot of work, but I don’t think my daughter ever uses her vocal cords to make telephone calls. Teddington was not the location of the towpath murders, a case that involved the murder of two teenage girls on the towpath near Teddington Lock on the River Thames, on 31 May 1953 (a mere nine days before my birth). The case garnered a great deal of press attention and was described at the time as “one of Scotland Yard’s most notable triumphs in a century”. The case is sometimes incorrectly referred to as “the Teddington towpath murders” despite the fact that the killings took place on the Ham side of the river. Teddington possessed no towpath! My son avoids phones as much as he can, too — to the point where, through lack of practice, he is even more awkward on the phone than I am — but he doesn’t text a lot either. It’s all done with his laptop. Why don’t they just leave that pig there? It could be the symbol of London, like NY and the big apple: London, the Floating Pig. That’s interesting, I hadn’t heard that one. The term was denounced as a pejorative by the Portuguese Finance Minister in 2008. Members of other international economic press continue to use the term…Others however, notably the Financial Times and Barclays Capital have restricted or banned the term, with the FT notably reducing but not eliminating its use. It’s odd that some people don’t like pigs. George Orwell kept pigs but didn’t like them, and that’s how they ended up the bad guys in Animal Farm. I love them. The Portuguese finance minister ought to have felt honoured to have that acronym for his group. I like pigs too but in that case it has a pejorative sense. Probably it’s the animal that has more names in Spanish (“cerdo, cochino, puerco, marrano*”) and all ones are also used to offend each other. By the way, the name of the minister of environment of the next Portuguese government was “Pássaro” (bird) but the prime minister was Sócrates. *From the Arabic; It mean “found anathema” and was even used against some converted Jews some centuries ago. “It is better to be a human being dissatisfied than a pig satisfied; better to be Socrates dissatisfied than a fool satisfied.” John Stuart Mill. More insults to pigs. Should I change my name to Socrates? It can’t hurt. That pig needs to exercise. These porridge are fuined by the committee’s leaving of its boots in it, innit? Have I now been trapped in Bridgwater too long? I am cracking. By that time Murray, who apparently had 12 children, may have been confused by number (or as m-l said, “subtleties when dealing with groups”). I’m sure he would have liked fuined, an underused word. I took my daughter to a little farm the other day to visit the animals. The pigsty was the only place that smelled bad. My favorite animals were the donkeys. Did the pigsty have that smell? I occasionally see a friendly donkey standing in a pasture up here, and I’ve noticed that it has very soft fur unlike the horses. I would like to have a couple of donkeys living here. Maybe this donkey is “Platero” reincarnated. I hadn’t heard of Platero. I wonder if it’s been translated. Yes, you can read the link “Notes” in the web page I’ve given. It’s an excellent book and, as you know, Juan Ramón Jiménez was a Nobel prizewinner. I’m sorry. I didn’t realize that there is just one page of this book in the link.